An aerial of 'Hempstead House', originally the Howard Gould estate designed by Hunt & Hunt c. 1909 in Sands Point and pictured under the ownership of Daniel Guggenheim. Click HERE and HERE for more on 'Hempstead House'. Photo from Arts & Decoration, 1921. Oh stop -- please; I'm gonna pee. The backroom shenanigans of the "Friends" reads like a really bad Dallas script. 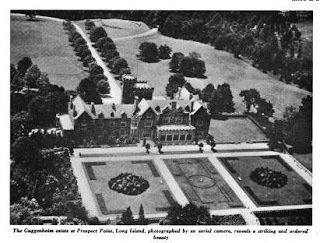 Another great aerial shot of a notable L.I. property. Keep them coming. Fantastic view when it was in it's prime. Formal planted parterres always seem to be designed for an airplane passenger, not fully appreciated from a pedestrian vantage point. DED, re pic linked below, that massive table, those legs! What is this style called? There are several similar throughout Castle Gould/Hempstead. The turnings on that refectory table are called melon-bulb turnings. But, wait, we're not finished. Before answering your question, I googled 'refectory table melon bulb' to make certain that I was not leading you astray, and lookie what one of the first results was!!! PS. I should qualify that---it doesn't appear to be the same table----they were as common as mud in the homes of plutocrats a hundred years ago, those refectory tables---but it was interesting that it was also a Gould table. "lookie what one of the first results was!!!" Well I'll be. Look at you. Melon bulb. I sure am glad to have that term, thank you. Even HRH Ralph misidentified the leg. well, howdie doo. Far be it for me to correct the man who's been showing us old WASPS how its really done, but those are melon bulb legs, yessiree. And at this link, we see a refectory table with baluster legs. PS Flo, I once bought a 14 foot melon bulb leg refectory table from the fake English great hall of one of the big summer houses up here. Need I add that it required renting a 16 foot truck? Whole lotta 17th century oak, that table. "(flo,remind me to tell you about the Ralph Lauren boots I bought recently. I will never, ever, take the guy seriously again after those)"
I'm all ears. Town & Country boots for showing up on trend? Like so? Hope you are safe, hope you have electricity, heat, water, and companionship.